Western Africa is often looked to as the best example of democratic development south of the Sahara. Of course, as any Africanist can tell you, trying to make generalizable statements across multiple African states is a foolhardy endeavor at best, given the vast diversity of the continent, not only from sub-region to sub-region, but in internal state politics as well. However, with Hillary Clinton’s recent democro-tour of four West African states and the amount of self-congratulation and feel-good speeches about the future of democracy in the region, the average outside observer would be forgiven for thinking that things are only looking up for free and fair elections. In fact, democratic activists are quite concerned about the February 26th first round of the presidential election in Senegal, and with good reason. The incumbent, President Abdoulaye Wade, has carefully positioned himself for another victory while opposition groups have decried his candidature, which they view as illegal, and taken to the streets, facing off against heavily armed state security forces. Mr. Wade, who, for some reason, looks supremely unhappy in the majority of photos he appears in, won the approval of Senegal’s Constitutional Court to pursue a third term in office, despite the new constitution, which he designed, limiting presidents to two mandates. The reasoning behind the ruling was that, since the new constitution came into force after he took office, Wade is only subject to the new law from that date onward. Opposition groups were quick to point out that this flimsy legal reasoning takes a turn for the absurd when one considers that the five-member Constitutional Court was fully appointed by President Wade. The court decision, on January 27th, led to an immediate outbreak of protests against the regime, largely spearheaded by opposition groups, namely Y’en a marre (colloquial for “fed up” or “sick of”), which has been focusing on youth mobilization, and Mouvement du 23 juin (named after the successful June 23, 2011 protests against the ruling party’s proposed amendments to the new constitution, which were decried as an attempt to further entrench the current regime in power), an opposition alliance that includes political parties, civil society organizations, and human rights groups. At least seven people have been killed in protests since the start of the presidential campaign and many more have been injured in clashes with state security forces, including Africa’s most famous singer, Youssou N’dour, who was banned from contending the presidential election (the remainder of the links are in French). President Wade has expressed his regret for the deaths, but was quick to blame one of the main opposition candidates, Idrissa Seck, for the deadly clashes. The latest drama has focused on state security forces blocking opposition groups from protesting at the Place de l’Indépendance in central Dakar. Thankfully, though scuffles have continued this week, the protests have been largely non-violent, which gives hope to those praying for stability in the country. EU foreign policy chief Baroness Ashton has called for the Senegalese authorities to respect the right of the people to protest, while the small EU observation mission had previously promoted an end to violence in the wake of the clashes in the capital. Ashton also praised the arrival of an African Union observation mission led by the ex-Nigerian President Olusegun Obasanjo. Obasanjo has the unenviable task of attempting to maintain a peaceful situation on the ground, especially as the fractured nature of the opposition has led many observers to conclude that Wade is headed to victory and thus uncharted waters in terms of opposition response. At the very least Obasanjo has pulled off the zinger of the campaign thus far, noting, in reference to his standing down from the Nigerian presidency under pressure from the opposition and other African leaders, including Wade, “If President Wade advised me not to run for a third term, which I didn’t do, he is without a doubt capable of advising himself [on the matter]” (translated from French, apologies as I wasn’t able to locate what he likely said in English). So, what is there to do on this matter? As noted above, many are already calling the election for Wade because of his power of incumbency and his image which, though it has been recently dragged through the mud, still stands as someone who has worked hard to pull Senegal out of economic stagnation. The opposition and many average Senegalese are likely to disagree with this, especially as questions over how much Wade’s reforms have helped the poor and how much they have fed corruption in the country remain quite salient. There is also worry that Mr. Wade is grooming his son, Karim, to take his place and thus establish a political dynasty (this was implicit in the June 23 protests mentioned above since one of the failed proposed amendments created a new position of vice president, which was viewed as a not-so transparent attempt to allow Wade to consolidate familial power). The best chance the opposition groups are going to get is if they’re able to rally behind a candidate for the second round of voting. Hopefully whoever makes the runoff will be able to mobilize a large enough anti-Wade contingent to make the contest close. Of course, this presupposes that Wade will be unable to win in the first round and, given the strength of patronage politics in Senegal and the power of incumbency, this might not be too farfetched, even without any vote rigging. And where does the U.S. stand on all of this? Following Wade’s court victory, the State Department called on the incumbent to cede his place to the next generation of leaders. This is fairly strong language, despite the fact that the U.S. noted its respect for the Senegalese political and legal process. In addition, the White House released a generic statement on respecting electoral norms and guaranteeing a free and fair election. This can be seen as a weak follow up to the earlier semi-attack on Wade. However, it’s more than likely a slight recalculation on the part of the U.S. government, as a peaceful electoral process may seem preferable to the incitation of more violence in the capital. U.S. leaders may fear a variation of the post-electoral crisis that gripped Côte d’Ivoire in 2010-11. At this point, all the international community can do is wait out the results, the die has been cast and it’s too late to keep Wade off the ballot. In fact, pushing too hard against the incumbent may lead to a panic compounded by the popular protests, which could only lead to further crackdowns. If the monitors find few irregularities in the process itself the key truly will be the mobilization of the opposition, but don’t hold out too much hope for Wade’s democratic defeat. While some opposition groups are also demanding the cancellation or delaying of the polls, this might only allow Wade to consolidate his position. I’m pessimistic that that type of action would foster greater stability or democratic accountability. As mentioned, for better or for worse Wade is going to remain on the ballot, the actual results and reactions thereof will determine how the international community can properly respond. Ironically, in September 2011 Mr. Wade made an appearance at the UNESCO headquarters in Paris to accept the “prix Houphouët-Boigny,” awarded to those who have “contributed in a significant manner to the promotion, seeking, safeguarding, or maintenance of peace.” Though the prize in and of itself is somewhat of an irony (named after the first President of Côte d’Ivoire, who is often accused of promoting “peace” only in a manner that benefited the interests of the former colonial master, France), the instability that has gripped President Wade’s Senegal since then has led to fears that more sustained violence may break out if he wins reelection. Of course, protests against Mr. Wade have been a part of Senegalese political life for many years now and the tepid reactions of Western states recall the stability and profit-seeking Françafrique that defined Houphouët-Boigny’s rule in Côte d’Ivoire. In his acceptance speech, Mr. Wade poked fun at his age, which his critics like to seize on in calling for his resignation, declaring “There is no age limit for fighting” (my translation of “Il n’y a pas d’âge pour combattre”). While the context was a fight for peace, a much different battle has been taking place on the streets of Dakar and within Senegal’s fragile democracy. Let’s hope that President Wade realizes that this type of prolonged fight for political power would be devastating for both his country and his people. The centerpiece of the visit was the first stop in Monrovia, Liberia, where the U.S. delegation attended Ellen Johnson Sirleaf’s swearing-in ceremony and inaugurated the new U.S. Embassy building. Liberia has seen its fortunes rise in terms of U.S. attention, especially with Secretary Clinton’s initiatives to promote political participation and social equality for women and girls around the world (including the creation of an Ambassador-at-Large for Global Women’s Issues, Melanne Verveer, who was a member of the delegation). With the reelection of Sirleaf, Africa’s first female head of state, and her reception of the Nobel Peace Prize, which she shared with another female Liberian democracy and women’s rights advocate, Leymah Gbowee (as well as Tawakkol Karman of Yemen), Liberia seems to be fulfilling a key component of Clinton’s foreign policy priorities. Of course, despite these notable achievements, Liberia has yet to become a bastion of political freedom in West Africa like, say, Ghana. But comparisons like that may be unfair as the country continues to heal from years of war. The new embassy is certainly a major gesture of goodwill, but whether recent revelations about Charles Taylor’s ties to the CIA will have any effect on the bilateral relationship remains to be seen. Following this victory lap in Liberia, Clinton’s team (which included the U.S. Executive’s heavy hitters on African affairs, notably Assistant Secretary of State Johnnie Carson and AFRICOM chief General Carter Ham) dropped in on President Alassane Ouattara in Côte d’Ivoire. While expressing her admiration for the progress made in the country since last year’s electoral crisis and calling for a unity government, there were reports that behind closed doors she pressed Ouattara on the issue of war crimes (links in French). According to diplomatic sources, in private Clinton called for the removal of Guillaume Soro, Côte d’Ivoire’s current Prime Minister, and an Ouattara ally, as well as anyone currently in a position of power in the government who could be linked to possible crimes during the post-election chaos or under Laurent Gbagbo’s regime. Clinton requested that anyone fitting this description appear before the International Criminal Court, at the very least to provide testimony. This is tied to two main issues in the post-Gbagbo Côte d’Ivoire: First, there has been concern that Gbagbo supporters have been treated harshly by the Ouattara regime and not provided adequate physical protection, resulting in unlawful killings and human rights violations. Second, the question of any unity government, which would ostensibly contain pro-Gbagbo members, is still a sticky subject for American diplomats. On the surface, the U.S. government wants to support stability in Côte d’Ivoire through a moderate, inclusive regime. On the other hand, however, the presence of officials in the government that can be tied to human rights abuses or previous overstretches of government power, especially by the military, may have a negative effect on any budding democracy and stability in the country. Clinton trod carefully, striking a balance between praise and pressure while revealing a U.S. that promises to be supportive of the new regime but still come down forcefully on issues of good governance and stability. After the quick stop in Abidjan, the delegation took a jaunt to Togo, the first time a Secretary of State has visited the small state (link in French). Observers were quick to note Togo’s current inflated importance, sitting as a rotating member on the U.N. Security Council. Envisioning possible votes on Iran and Syria, it was easy to tack the Togolese onto this short excursion. On the agenda was anti-drug smuggling and anti-terrorism; U.S. offers of cooperation in these areas can go a long way in beefing up a small state’s security forces. Compared to Liberia and Côte d’Ivoire, there isn’t as much to praise in Togo’s political system. In 2005, President Faure Gnassingbé took over the position from his father, Gnassingbé Eyadéma, who had held power for 38 years. His reelection in 2010 was marred by fraud allegations, but it seems that real attempts are being made to shore up the country’s image and improve the economy. Jeune Afrique shrewdly noted the presence of Donald Steinberg, the Deputy Administer of USAID, in the American delegation, and openly questioned whether the reopening of USAID operations in the country, which were suspended during the ‘90s due to Togo’s “democratic deficit,” are a bargaining chip for that crucial Security Council vote. Indeed, a combination of USAID money and increased anti-terrorism and anti-drug funding would be music to the ears of President Gnassingbé. Suddenly it seems like Clinton’s trip has veered away from its lofty goals of promoting democracy in West Africa, as diplomacy in Togo just looks like old-fashioned propping up of dictators for political favors. However, legislative and local elections are on the table for 2012 and the main opposition party, the UFC, was given seven ministerial positions following the 2010 elections (link in French). If there ever was an opening to push for more democracy in the country, it’s now, and it seems like the State Department has found an opportunity to both get what it wants at the U.N. and promote inclusive democratic governance in Togo. Assistant Secretary Carson gave Gnassingbé a lot to live up to when he stated the president is “determined to put in place a strong reform-minded government – one that is democratic, multiparty and which opens up the country.” Let’s hope he’s right about the Togolese leader’s will to step up to the plate on democratization. Before heading home, the delegation island-hopped to Cape Verde, where the Secretary met Prime Minister José Maria Pereira Neves. The island nation is often looked to as a paragon of democracy in Africa, though it is somewhat removed from the continent itself. Nonetheless, it offered the perfect capstone to a trip that had democracy at its heart. So how should we rate this excursion by the Secretary? Despite the fact that it was relatively short, I believe it’s important to show that the United States is still actively engaged on the African continent. As mentioned at the outset, the constant talk of shifting U.S. policy priorities towards Asia has many wondering if this means other U.S. initiatives, especially democracy promotion around the world, are bound to suffer. The U.S. State Department is much more complex than that. Indeed, as I previously mentioned, the tilt towards Asia isn’t geographically limited to the Asian continent. As China builds new relationships in sub-Saharan Africa and South America, the United States is going to be on the alert to attempt to counter Chinese influence. While, in my opinion, China’s increased role in global affairs isn’t something that threatens the United States from a security standpoint (nor is it something that can be “countered”), it’s clear that, as the economy recovers, American businesses are going to be on the lookout for investment opportunities in foreign countries. The U.S. government realizes that if they don’t act to shore up relationships with developing states, U.S. businesses are going to pay the price. And as more people begin to fret about the security situation in Nigeria, building U.S. influence in the region is a clear precursor to growing U.S. involvement in the energy sector in the Gulf of Guinea and increased anti-terrorism cooperation across West Africa. At the very least, Clinton’s visit shows that the U.S. remains committed to democracy in Africa, and that’s not something to be taken lightly in the continued development of the continent. It’s been a bad couple of weeks for media freedom in two very different parts of the world. In the Democratic Republic of Congo (DRC), the newly (re)-inaugurated president, Joseph Kabila, and his regime took Radio France Internationale (RFI) offline for several days, threatening Congolese access to external sources of information. Perhaps an even larger blow to personal liberty was struck in the authoritarian stronghold of Belarus, where President Lukashenka’s regime began enforcing a law that seriously undermines Belarusian citizens’ access to the internet. Both of these developments are tied to the changing political situations in the countries, but what are the implications for both states’ futures? On December 31st, DRC Communications and Media Minister Lambert Mende accused RFI of supporting Etienne Tshisekedi’s claim to the presidency (he was Kabila’s main challenger in last year’s presidential election) and of acting with “deliberate will to create a confused [political] situation which can lead us to confrontations between Congolese,” and thus their signal would be cut off until further notice (all DRC links in French). The French radio service had also had its signal disrupted several times following Tshisekedi’s proclamation that he alone was the true president of the country on December 23rd. On January 6th, the U.S. State Department denounced the move as amounting to “censoring” the media in the country and called on the government to immediately reestablish the station’s signal. Fortunately, on January 9th RFI service was restored, with Minister Mende noting (as if there had been nothing strange about the cutoff) that the enforced outage was “finished” but ominously stating that the station needs to have submitted to Congolese law if it wants to continue to enjoy its broadcasting rights. However, this is a hollow victory for media freedom in the DRC, as two other national media chains which are regarded as close to the opposition, Radiotélévision Lisanga and New Canal futur, remain suspended. Unfortunately, the “victory” in the case of RFI may divert attention away from these other politically motivated blackouts of media outlets. This isn’t the first time, and most likely won’t be the last, that the Kabila regime has manipulated media freedoms inside the country. Indeed, RFI had it’s signal cut off from July 2009 until October 2010 after the authorities accused the station of “lowering the morale” of the army. Perhaps more worrying was the suspension of SMS services across the entire country on December 3rd, just after the bitterly contested national elections. Vice Prime Minister of the Interior, Adolphe Lumanu, stated that the action “was taken in order to preserve public order and assure a happy outcome to the electoral process.” Service wasn’t restored until December 28th. Infringements on media freedom directly impact citizens’ ability to participate in the political process. So, political freedom is directly connected to a free media. In the case of the DRC, geography matters, especially for communication networks. The DRC’s massive size and lack of infrastructure allows the state to clamp down easily on important frequencies or entire stations if they so desire. In addition, to shut off SMS service deprives large numbers of citizens of one of their primary means of communication, especially with friends and family. These moves by the Kabila regime show there to be considerable government concerns about possible organized protests à la Arab Spring, but they also reveal the desperation of a prototype failed state to keep control over its citizens. This same type of desperation is on full display a little further north, in Belarus. In this case, however, the state isn’t failed, but rather inching in a more all-consuming direction. As mentioned above, the Lukashenka regime has brought into force a new law that restricts citizens’ internet usage and compels service provides, including internet cafes, to record the web traffic of each individual. Several opposition political websites have made their way onto the blacklist. This all comes on the heels of the massive crackdown on the democratic opposition following last year’s rigged presidential elections, in which Lukashenka won nearly 80% of the vote. Even as the Belarusian economy has tumbled, the regime has only been tightening its grip on power. In contrast to the DRC, where state authorities also may have complete control over certain communications networks, Belarus has several characteristics that allow for external intervention despite regime lockdown. Indeed, Belsat, which receives Western funding and is based out of Poland, continues to broadcast satellite news from the outside to offer an alternative to state-controlled media in Belarus. Of course, Belsat operates at a low level and its journalists undertake significant risks reporting from inside the country, but as its viewership has risen above 10% of Belarusian citizens, there is hope that progress can be made on increasing Belarusian exposure to alternative forms of media. The internet crackdown, which can easily be linked to the deteriorating economic situation in Belarus, could herald new attempts by the regime to clamp down on this type of external broadcasting as well. Belarusians’ exposure to external media is critical to expanding their political consciousness, and possibly leading to further popular democratic uprisings in the country to match those that took place in the wake of last year’s flawed elections. This is a long-term goal, but the efforts of those that promote media freedom in the country are of utmost importance to Belarus’ future. In addition to these challenges to the Belarusian authorities at home, the U.S. has upped the ante, and new sanctions are due to come into effect soon. As media crusaders battle on in Belarus, are there any lessons to take from their struggle that could be applicable in a country as different as the DRC? There already are several independent news outlets that operate in the DRC, notably Radio Okapi, which is funded by the U.N. Promoting local media sources would be important, if the money or support from the international community was there, and it clearly isn’t. In a country as vast as the DRC, especially with its infrastructural problems, it’s going to be very difficult to set up and maintain quality local news outlets without more outside aid (something Belsat continues to enjoy) and, unfortunately, as alluded to in my previous post, American policy in the DRC continues to be rather passive. As for the possibilities of external broadcasting, they would run right into several problems. Obviously infrastructure, importantly internet penetration, is a major stumbling block, but there’s also an indelible legacy that gets in the way of any serious discussion on the topic. The history of insurgency in Central Africa is defined by rebel groups building their forces in neighboring states before launching their anti-government campaigns. Any type of external broadcasting by political exiles, who are clearly present in all of the surrounding states, would be too easily tied to ambitions of violent takeover of the DRC and the perceived threat could be instrumentalized by the Kabila regime to only further crack down on opposition groups and free media. However, the DRC is not the monolith that the Belarusian state is (or at least pretends to be), and a slow but steady approach of spreading new political ideas may be the best way towards the Congolese people undertaking a popular campaign to demand their political, civil, and human rights. If the Congolese are to take a lesson from the Belarusian activists, it should be that, although their work is dangerous, it is necessary to secure the future freedoms of all citizens, and it is their present perseverance that will define the future of their country. It was almost one year ago that protestors across Albania, principally in Tirana, mobilized against Prime Minister Sali Berisha and his Democratic Party government. The manifestations of public anger had been primarily organized by Albania’s Socialist Party, led by then mayor of Tirana, Edi Rama (Rama lost his reelection bid to Lulzim Basha, the former DP foreign minister in the most hotly contested electoral battle of the May 2011 local elections). These protests, which were a continuation of the political dispute that had gripped Albania since the 2009 parliamentary elections, threatened to throw the country into disarray, not because of the protests themselves, but due to the state reaction. On January 21st, following fringe demonstrators setting fire to cars and hurling rocks and eggs at security forces, the police struck back. Four demonstrators were killed and over 40 people, including police officers, were injured in the ruckus. 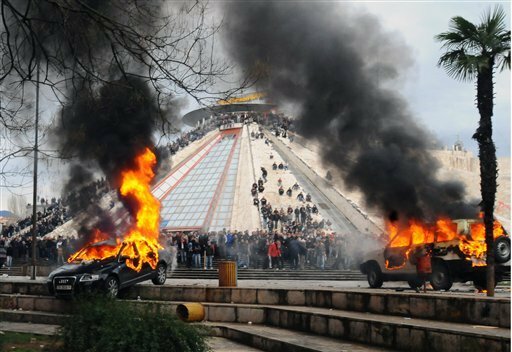 Seeing images of burning vehicles and running protestors in front of the iconic “Pyramid” in downtown Tirana, formerly Enver Hoxha’s mausoleum, raised the specter of the anarchy that engulfed the country in 1997. Indeed, there is a monument in front of the Pyramid with a bell meant to represent youth voices standing up for peace, legitimacy, and a better future (my rough translation). These clashes represented a direct threat to Albanian democracy; two incredible symbols of Albania’s past of turmoil seemed to be giving birth to the present breakdown. Following the deadly protests and an outcry against the police violence from the international community, Sali Berisha declared that this had been a coup attempt and attempted to lead a political witch hunt against the Socialists, the Chief Prosecutor Ida Rama (not related to Edi Rama), who had called for a full investigation into security force violence, and even the President, Bamir Topi, a former DP official before taking up the nonpartisan position. Luckily, the international community didn’t bite, despite several lame attempts by non-Balkan watchers to link the violence to the Arab Spring, and swift rebukes were in order, including from Albania’s most treasured ally, the United States. However, as the year progressed (read: after the bitterly contested local elections were sorted out) the tensions began to relax, and last September the infamous parliamentary gridlock, which had prevented the passing of laws that required a 2/3 majority (importantly, laws with E.U. accession implications), was tentatively broken. So, what does this next year have in store for the Land of Eagles following a 2011 marked by state violence against demonstrators, ridiculous talk of a coup, and now apparent calm? Over at Balkan Insight, Besar Likmeta attempts to strike a balance between being hopeful that a turning point has been reached in the Berisha-Rama battle and the realist viewpoint that this is only a lull in the fighting. Quoted in the article is Lutfi Dervishi, a political commentator who believes that the fragile peace may last through the July presidential elections (which is not a popularly elected position, but rather chosen by a simple parliamentary majority) but then unravel as the 2013 general election preparation kicks into gear. This seems to be the most likely scenario and the selection of the next president could have a crucial role to play in the continued struggle. A candidate with Democratic Party connections could be construed as an attempt to influence the nominally nonpartisan position, especially after Berisha’s attacks on President Topi following the deadly demonstrations as well as a public dispute over the appointments of Supreme Court judges. Since the beginning of the new year, Berisha has brought four government institutions directly under the control of the Prime Minister’s office, removing them from normal government control. Some are already worried that this will undermine the neutrality and independence of government administration. The Socialists, however, are most concerned with wrestling back control of the parliament, and any kinds of anti-democratic developments might provide them with more ammunition to reignite protests against the current government, perhaps hoping to goad the security forces into another rash move. The chances of renewed violent civil unrest in 2012 look slim, unless President Topi’s successor is seen as politicized. It seems like the best chance for the Socialists will involve focusing on the economy, which has been slowing down over the last year (the National Institute of Statistics is one of the entities Berisha recently brought under the direct control of the Prime Minister’s office…let the conspiracy theories on economic growth numbers commence!). The Socialists may be tempted to take a page out of the U.S. Republican Party’s playbook: sit back, relax, and obstruct reform legislation. Using some of the Berisha regime’s less democratic measures as cover, it might behoove the Socialists to watch the country sink while pressing for a big change in 2013. Of course, the E.U. question looms large over Albanian politics, and is supposedly something all sides agree on as important to Albania’s future. While I don’t believe the current weakening of the E.U. will have much of an impact on Albania’s desire to join the regional bloc, a more complete collapse of E.U. institutions could turn Albanian politics on its head. Without an issue to join hands over, the country could head back to the political doldrums of the past two years. Albania’s past elections have been marred by murders of candidates, racially tinged protests for and against Greek minority rights, and allegations of voter fraud and corruption. If the presidential election remains non-political and the economy steadies itself (perhaps a tall order) there is a chance that the center of Albanian politics could hold. The longer Albanian political parties cling to this (at least cosmetic) cooperation, the better prepared the country will be to hold more democratic elections in 2013. As news outlets constantly remind us of the “tense” and “explosive” situation on the ground in the Democratic Republic of the Congo (DRC) following the contested Presidential poll of November 28 (and a few days after…and allegedly before), critics have appeared, not just of the clearly deficient election process itself, but also of the international response to the flawed results. In Foreign Policy magazine, Mvemba Phezo Dizolele, a visiting scholar at Stanford and a member of the Carter Center observation mission in the country, decries what he sees as a lack of Western response to the manipulated election. But what explains this muted and rather tepid response by the Obama administration, which recently stood up for the democratic process in Russia, upsetting Vladimir Putin and calling into question the longevity of the “reset” strategy. In fact, the nature of the U.S. response should not be surprising, and reflects several key factors, both in the corridors of power in Washington and in the situation on the ground in the DRC. In a Winter 2009 article for African Affairs, Nicolas Van De Waal argued that U.S. State Department institutional capacity in sub-Saharan Africa was declining and, while hopeful for the future, struck a tone of skepticism towards the Obama administration turning this situation around. Despite the fact that the U.S. government (USG) deployed election observers in every DRC region, under the auspices of the Carter Center mission, it is likely that travel inside the country by U.S. Embassy staff is extremely limited outside of Kinshasa, especially in the East of the country, where numerous rebel groups still operate in low-level insurgency. Security considerations and travel restrictions thus prevent an extension of diplomatic presence throughout the country, which is so vast it could host an economic-focused consulate in the East if the region was more secure. The USG seconding its election monitoring out to the Carter Center’s mission gave the possibility of having it both ways, allowing the Carter Center to come down hard on the elections while freeing the USG to take a more tempered approach that ruffles fewer feathers. This despite the fact that the USG does not shy away from its complete association with, and funding of, the Carter Center’s mission. It’s a rather strange position to be in, and more than anything reinforces De Waal’s contention that USG institutional capacity in many African states is severely lacking. December 1st, U.S. Ambassador James Entwistle delivered remarks on the elections, broadly praising Congolese citizens for voting and participating in local observation of the process. While he noted “irregularities” and regretted several violent incidents, it was mainly a positive speech that attempted to link in with the Congolese people and salute their efforts. However, has their been any real response behind this rhetorical posturing? De Waal would argue that the State Department and Ambassador’s statements reflect that the USG lacks leverage inside the country to affect any serious change and thus is relegated to light scolding while rallying against possible outbreaks of violence. On another level, the American response reveals a deep cynicism that has long dominated U.S. policy in sub-Saharan Africa. The USG knew before the elections that this was the likely result: a technically flawed poll that would comfortably return Kabila to power. For the U.S., whether a completely clean poll would have brought Tshisekedi to power is irrelevant. Kabila still controls state security forces and, though his popularity in the East of the country has fallen, this is mostly to the benefit of other candidates (besides Tshisekedi) and rebel groups. It’s clear that the State Department views Tshisekedi, along with the other presidential candidates, as a potentially destabilizing factor in the delicate balance of the DRC non-state. Whether economic interests are at play as well remains half-truth, half-conspiracy theory, but the point remains that stability and security are likely the primary objectives of the State Department and Obama administration. While I broadly agree with Stearns’ critique, it’s clear that the U.S. government is less concerned with substantial democratic progress in the country and more concerned with maintaining stability while slowly building democratic norms. Of course, how well these norms can develop through consistently flawed elections remains a point of contention. For James Talbott, writing in Foreign Policy magazine, even flawed elections can have benefits for society if they get people to react against perceived injustices. Is the U.S. government endorsing this approach? I don’t know, but without a doubt right now the Obama administration is praying for stability in the country, not necessarily democracy.